The media keeps claiming that President Trump is encouraging violence against them. But the media are not the true victims here, and they will largely have themselves to blame if violence does befall them. Talking about Trump, MSNBC's Katy Tur said last Friday: "Yeah, we get it, you don't like us. Fine. But do you have to put our lives in danger?" After the Capital Gazette shooting in Annapolis, Maryland in June, press members and Democrat campaign officials were quick to blame it on Trump’s bashing of “fake news,” which he called the “enemy of the people.” Apologies weren’t forthcoming after police declared the shooting a “targeted attack.” The killer had a long, troubled relationship with the paper, which he had sued for defamation over a July 2011 column. Mass public shooters may begin to realize that shooting up a liberal media outlet would create a publicity firestorm. These shooters crave attention and pick targets where they can cause maximum casualties and gain maximum notoriety. Let's hope that people don't get to thinking that killing people in the media is a special ticket to notoriety. Of course, this is no different than the impact that the media has on these attacks by continually mentioning these killer’s names. Reporters decried the Capitol Gazette shooting as “one of the deadliest attacks on journalists in US history” and said it “may be the worst mass shooting of journalists in the country.” While understandable from the media’s perspective, giving so much excited coverage creates an incentive for someone else to come along and try to cause an even bigger sensation. If you were a killer who craved attention, who would you attack? A Republican congressman or someone in the media? The inevitable “I told you so” comments that we would hear if violence actually occurred against the media seemingly guarantees a level of coverage that can't be attained by an attack at a mall, movie theater, or even school. There is surely no symmetry here. The media doesn’t acknowledge any responsibility for threats on congressmen and the attack on Republican congressmen last year. 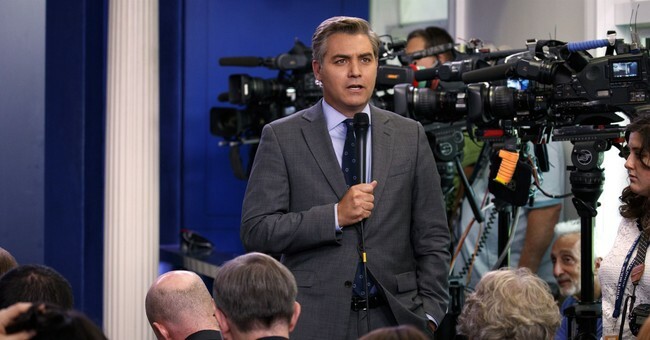 There was also no similar mainstream media outrage when President Obama accused Fox News of being “destructive” to the country or said that his administration needed to “pretend” that Fox is a “legitimate news organization.” The Obama administration even spied on Fox News reporter James Rosen and also CBS reporter Sharyl Attkisson. But the mainstream media acted like it was Fox News’s fault for being in Obama's crosshairs and they ignored Attkisson’s case. Obama expected the mainstream media to be nice to him. In 2008, he kicked newspaper reporters from the Dallas Morning News, New York Post, and Washington Times off his campaign plane because their coverage wasn’t favorable enough. With the mainstream media's constant false claims about supposed lies by Trump (see here, here, here, here, here, and here) and the frequent allegations that he is a racist, one can only marvel at the media’s self righteousness and thin skin. Many reporters have made it their jobs to lie about Trump, and when he calls them out for it they accuse him of endangering their lives. Some of these attacks are ludicrous on their face. Would a racist with white supremacist supporters keep bragging about record low unemployment rates for blacks and Hispanics? Would he keep pushing for policies on immigration, crime and education that he argues would particularly help these groups? The media's dire warnings about Trump in just the last week could fill an entire article. “This behavior happens in an authoritarian societies, where leaders and supporters are pushing down people and the media protests,” claimed CNN’s Jen Psaki. The New York Times’s Mark Landler linked Trump’s language “to Stalin, to Mao, to Lenin. . . . totalitarian societies . . . .” “We are being led down the drain by President Trump,” declared CNN’s Jake Tapper. Many shows such as NBC’s “Meet the Press” are so biased that “balance" means hosting Democrats alongside Never-Trump Republicans. The media has to realize that giving a huge amount of attention about possible violence against themselves makes that violence more likely. Their reaction to Trump's counterpunching is painting a target on their own backs.